Green-fingered colleagues from city-centre firm Arup have given up their lunchtimes and evenings to grow vegetables on the grass outside their offices. 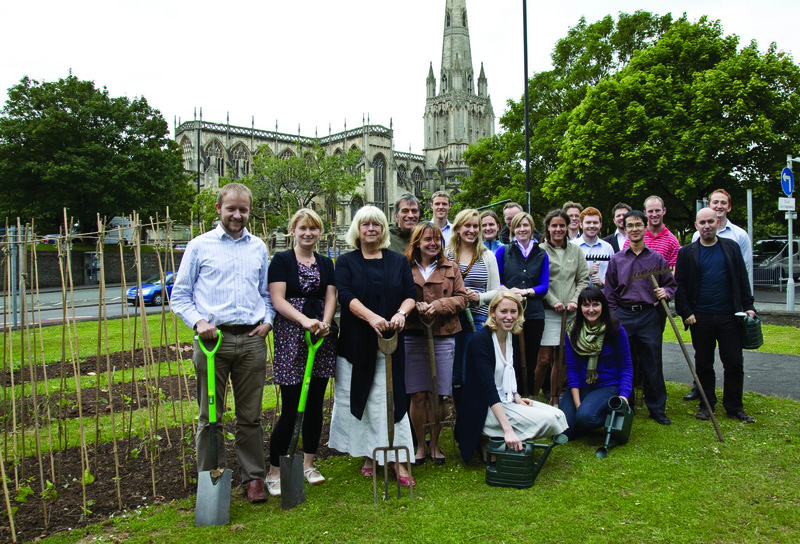 The team of employees from the consulting engineering firm approached the city council in the spring to suggest planting on some spare land outside their office opposite St Mary’s Redcliffe. The land is owned by Bristol City Council, and is in line with the council’s desire to see more food planting in parks and open spaces. This is an excellent project and highlights the potential of planting on land right in the heart of the city centre. The Arup employees are setting an excellent example to grow their own, and make the most of spare grass and land around the city. The council is pleased to support this project, and I hope other businesses around the city will be inspired to follow suit and people will be able to see how growing their own food can easily be done. It’s fantastic to be given this opportunity by the council. Our group is really keen to grow our own low carbon food and hopefully inspire some other would-be veg growers in the office and in the wider community. Food growing was successfully trialled last year in Castle Park. This has been extended this year to another section of the park, plus some herb and salad beds were installed in Cabot Circus during the recent Garden Life Show.